Please,can you show me this living room from the other corner? haha .. this is too clean and classy! I like the way you match the colors. 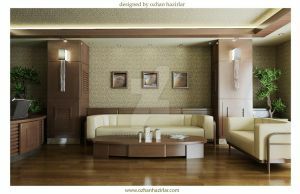 Hi, I would like to buy same 3D render images from modern office furniture. Can you design it? How much it going to cost for each image? I can send you more details. Please add me. This is really good,I would really appreciate it if you let me know what program is used to create this. Absolutely stunning and convincing. This is really impressive work; I thought it was a picture. What a great room design, as well! Nice, what render engine did you use. Looks very photorealistic, kinda like Maxwell - am I right? are you sure, it's no photo? I'm inlove with the flesh-like colored wood on floors and table, its great! nice design, but i always wonder.. about the holes in the roof... sometimes u couldn't make it when there is another apartment above... so i heard about the reflective tunnels which reflect sun light throught tunnels till it enters the apartment. Fridaylicious is a weekly themed art feature. This time it's all about ROOMS and your deviation was featured! very realistic. it is one of my greatest 3d art i have ever seen in my live.